No. 2 seed Boston Brute Squad and No. 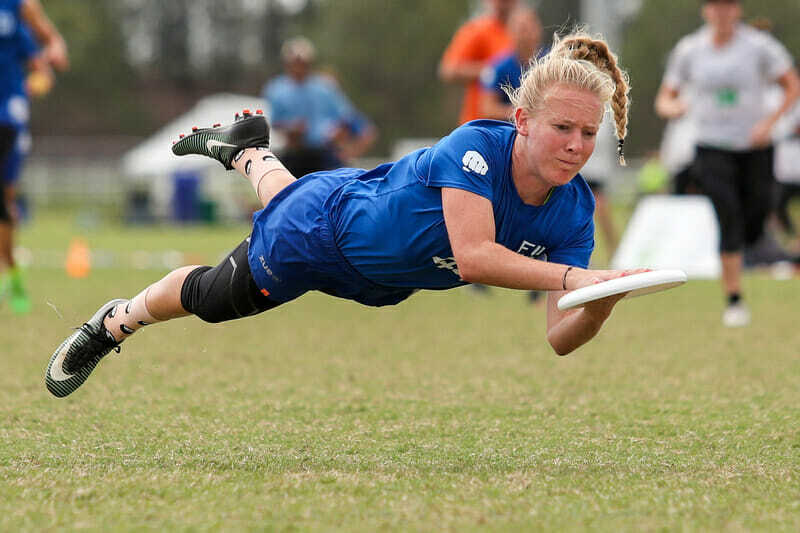 4 seed San Francisco Fury are set to square off with a national championship on the line Sunday afternoon. They have clearly been the two most dominant teams in the Women’s Division at Nationals, imposing forces that have demolished nearly all comers. The collision course was set early on, and with only Molly Brown offering up enough resistance to be a brief detour, have arrived at the intended destination. Boston was mostly unchallenged up until semifinals. They have a +35 point differential, holding court over Pool B and burying Nightlock 15-6 in quarterfinals. Even Molly Brown seemed like just another uncredited villain in the Brute Squad action movie to be quickly dispatched and never heard from again. But in classic Denver fashion, they tore their way back into the game, testing Boston for the first time at the tournament. Even then, Brute emerged victorious, 12-10. Meanwhile, Fury laid waste to Pool C before even reaching the bracket. They’ve won both their quarter and prequarter by 10 goals, leaving tough teams gasping for air with their efficiency and depth. They confidently go all the way down the roster, taking advantage of every resource they’ve cultivated in a way few teams can match. Even with a large lead, they never seem to go the lulls that trouble so many favorites. And there’s reason to believe each team should be the favorite. Boston is 2-0 against Fury, with five and two point victories from the regular season. In addition, Brute stands 4-1 in the series over the past three seasons. They are the two-time reigning champions, so they obviously know how to peak at the right time. But Boston has played closer games. Fury beat Ozone by 10, compared to Boston’s 6 point win against Atlanta. By most accounts, San Francisco has been the strongest overall team at the tournament. With the wind likely to be in attendance at the stadium, it should favor Fury. Boston has also been strong in the wind and is also a smart defensive team, but San Francisco looks immensely comfortable in conditions that have thrown off so many other teams. Everyone on their roster looks ready to deliver quality throws with and against the win. While they’ve been able to cruise through Sarasota’s signature weather, their defense has been able to harass offenders struggling with it. This is the final we deserve. Two teams with far more strengths than weaknesses who are well equipped to handle the conditions will meet with the title on the line. The build up over the past three days is palpable and it seems like either squad has a fair chance, reason to hope, and purpose to fight. Comments on "Fury Looking To Return To Top Of The Division Back In Sarasota"